While some of those teaching other P.I. courses are parking lot managers and security guards (not kidding...do your homework! ), our lead instructor, David Gibb, has worked in the trenches as a private investigator for over three decades! He has seen and done it all, and enjoys sharing his wealth of insights into the world of private investigation with new recruits. You'll enjoy the value of his experience, as well as his entertaining and funny stories of a life in the shadows - seeing and doing things that most people would consider unimaginable. Whether you choose to conduct surveillance, find missing people, dig into people's backgrounds, or dive into deep undercover work, the life of a P.I. is unlike any other profession. But it's rarely as glamorous and high society as it is on TV and in the movies. 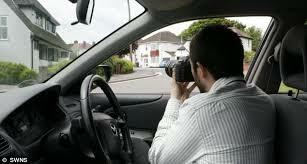 At AIS, we'll explain the harsh realities of life as a private investigator in Ontario. You'll learn the good, the bad, and the ugly aspects of a life spent working in the shadows. No sugar-coating here. Just the unpolished truth, in all its pain and glory. While some of the (government-prescribed) material covered in this course could be considered dull (if not mind-numbingly boring), you'll enjoy David's fantastic sense of humor as he navigates you through the driest of the mandatory study material. It's like having a personal guide in the wilderness. Or something like that. Our 50-hour ONLINE training course is designed to prepare you for your Ontario private investigator licence test. This is mandatory training, required by the Ontario government, that must be completed before candidates are permitted to apply to take the provincial test. A minimum score of 77% is needed to pass, and AIS is here to ensure your success! Upon completion of our intensive web-based course, students will be eligible to write the provincial test to obtain their private investigator’s licence. Full details on how and where to write the test, as well as how to best prepare for it, will be provided to all students during the course. The 50-hour course includes detailed online instruction (which includes video links and visual learning aids), coupled with real-time interaction with your instructor (whenever required). Online meetings and workshops are also offered occasionally, during which students can ask questions about the course material - and the investigation industry in general.